Lately I’ve noticed a number of articles with gripes and groans about the Android user experience, the way interfaces are designed, the usability of Android apps, and a lack of satisfaction with the whole Android ecosystem. As someone who works on day-to-day basis with usability testing and user experience design, my interest was piqued. Were these users just iPhone users who expressed dissatisfaction after a brief flirtation with Android, or was there something deeper going on? I can’t honestly say I’ve had a lot of experience with Android – although I do own two iOS devices – so I couldn’t write off these concerns one way or another. But rather than basing it off a few, possibly biased opinions, it seemed the fairest way to compare the two was to set up a quick usability test. This particular tests uses two different questions types; an A/B test, and a Preference test. 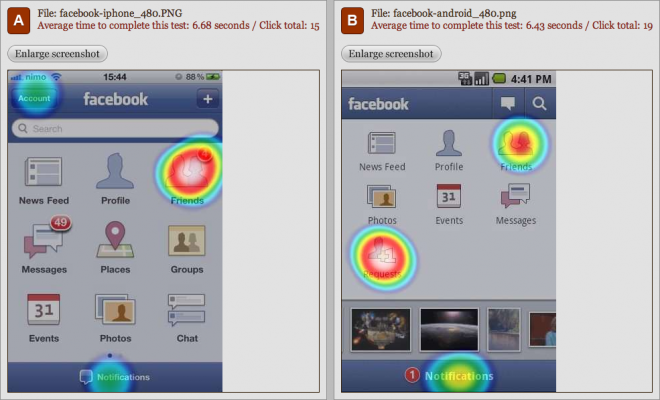 An A/B test is where you are presented with either image A or B (not both) to see how you interact with it in isolation. When looking at the results you get a fair comparison between A and B, and thus have a fair idea of how the two different designs or interfaces compare. It’s easy to judge which interface is the winner if it takes users a lot longer to interact with one than the other, or if they frequently select the wrong location or button for a simple task. A Preference test has the two designs or interfaces side by side. This is a bit more of a popularity contest, but in the interests of fairness I’ve obscured the ‘status bar’ (the bar at the top) of both the iOS and Android apps in the preference test in order to try to eliminate people’s personal, preconceived preferences. When looking at the results, we can hopefully detect a trend about which interfaces or designs people prefer. I know there are many people out there firmly on one side or other of this debate, but hopefully this test might help you to reconsider your preconceived notions. If you are interested you can take the test yourself to add to our results. 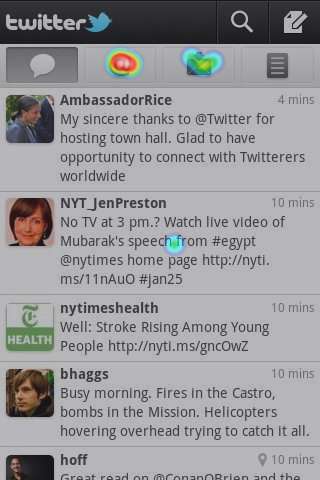 1) The Twitter App: How would you view your @ messages? If you are a Twitter user, and even if you’re not, you are probably familiar with the @ message protocol. For those who aren’t, @ messages are the method you use for contacting other users on twitter. For example, if you wanted to contact me, you could send a message to @IntuitionHQ. As a very simple, very common task, this should really take no time to complete. As it’s the first question in the test, we might expect people to take a few seconds longer as they are familiarising themselves with the interface. The results for both for the Android and iOS versions were very similar; the most surprising thing here was the amount of people who clicked the direct message button instead of the @ message button. I guess Twitter still isn’t quite as popular as I may think. 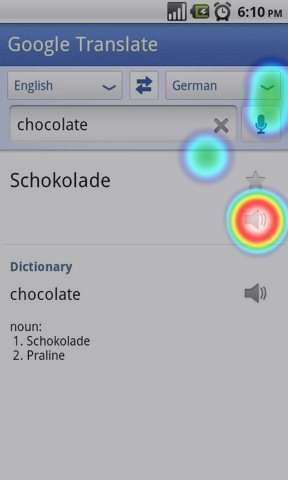 2) Google Translate: How would you change the target language from German to another language? Again, quite similar results. The Android version had a shorter response time at the time of writing by 2 seconds (possibly because of the addition of the arrows on the dropdown?) but also had slightly bigger spread of results. More or less a tie for these two. 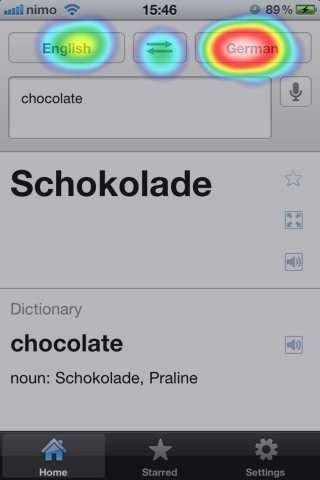 3) Google Translate: How would you listen to the German audio pronunciation? This is one of the really handy features of the Google Translate app – you can make it talk to you in a ton of different languages. 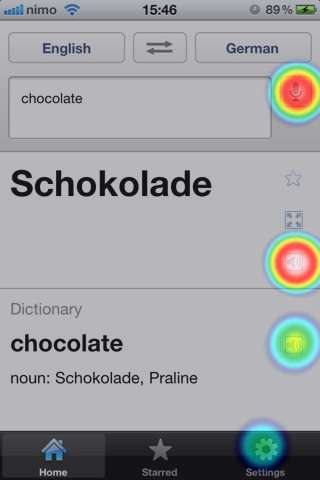 Extremely useful when you are travelling or trying to learn a new language, and a common task within the app. This is the first time (at the time of writing) that there is a bit more of a spread in the results. The Android app had a longer click time (average of 12 seconds), but an 80% success rate, whereas the iOS app had an average click time of 6.42 seconds but only a 52% success rate. Regardless of click time, a 52% success rate isn’t nearly high enough, and so the Android version wins this battle. The Android app Speaker icon must be clearer to most users. 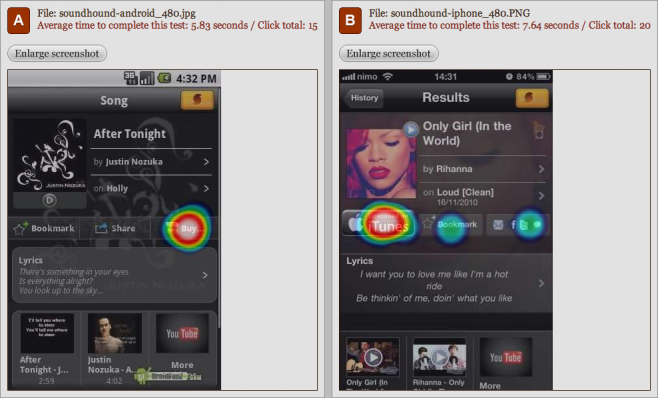 4) Soundhound: How would you share this song? Soundhound is a handy app for finding the name of songs you are listening to but (obviously) don’t know the name of. The social aspect is obviously a big part of making a successful app in this day and age, so it’s essential that users can find and understand these task very quickly. Interesting results; although the click success percentage is more or less the same (93% to 95%), the average click time is really very different. The iOS version took around 13 seconds longer in our test than the Android version. A win for Android. 5) Soundhound: How could you purchase this track? Buying the songs that you’ve gone to the effort of finding is another handy feature of this app. How does the music purchasing stack up? Android is slightly ahead here, with an average click time of 5.83 seconds to the iOS versions 7.64, and a success rate of 100% to iOS’ 90%. Still a win for Android, but I’ll give half a point to iOS for still a very strong results. 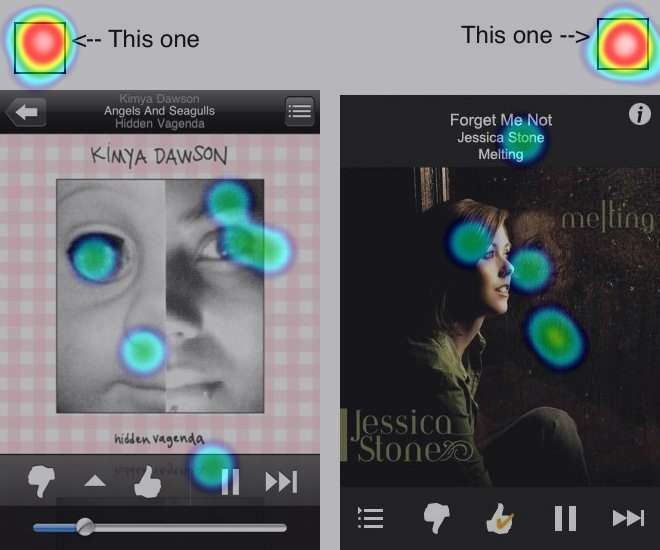 6) Pandora: Which interface do you prefer? This is a preference test to see how users feel about the different designs of the Android and iOS apps. I’ve removed the status bar at the top of the apps in order to make people think a little more about which is the Android or iOS version of each app. And now the results for the first of our preference tests; it couldn’t be any closer with both the Android and iOS versions of the app getting 17 clicks each. A draw. 7) Pandora: How would you pause this track? A very common task in any music listening application; I’d expect a very strong response on this question. The results here (perhaps unexpectedly) are both very strong. Both apps had a 100% success rate, and with just over half a second between the average click times (3.64-2.86 seconds) I’m going to give both apps a point for this test. 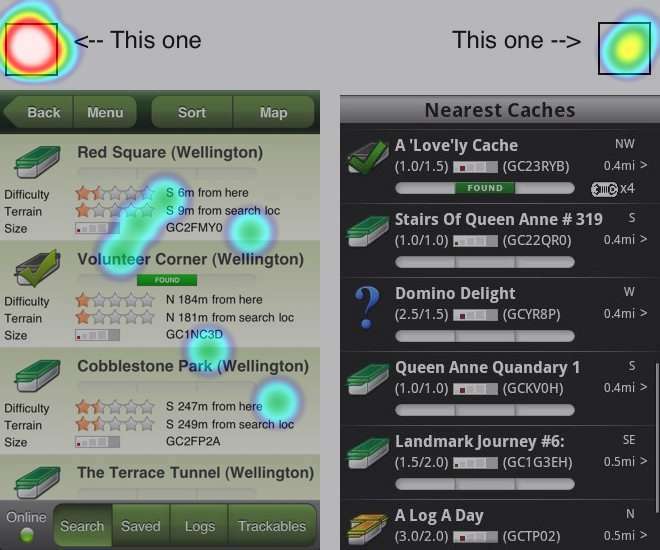 8) Geocaching: Which interface do you prefer? Another comparison between an Android and iOS interface, this time for the official Geocaching app. Geocaching – for those who don’t know, is a process where you navigate to certain GPS coordinates in order to find a hidden ‘cache’. The designs of the two are further apart than some of the designs we’ve seen, so it will be interesting to see what the results show up. Another overwhelming result, but this time to the iOS versions – 91% of respondents preferred the iOS version of this app. Once you’ve found a certain cache, you tag it in the app and it then shows up as previously discovered. This is a quick test to see if that is easily noticeable in the Android and iOS apps. An interesting result here. The click time for both apps was very similar, but the success rate for the iOS version was only 40% compared 100% for the Android version. Quite surprising to me that there was such a big difference between these two, but there we are. A win for Android. 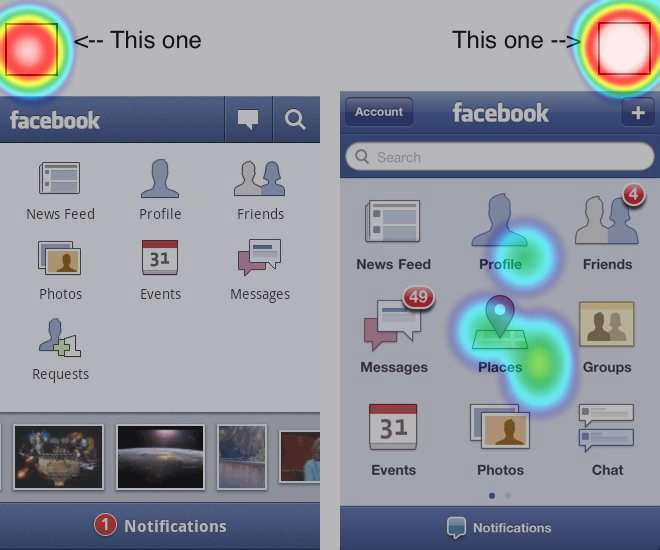 10) Facebook: Which interface do you prefer? Definitely the majority support the iOS version of the Facebook app here. I wonder how much of this is because they are already familiar with the design? The final results was 74% for iOS and 26% for Android. A win for iOS. Facebook is all about friends, so accepting requests is core functionality for this app. It may only make a few seconds difference, but every part of the user experience counts. An extremely close result here, and in fact any of the selected areas allow you to view your friend requests. Considering the results are within a quarter of a second, I’m going to call this one a tie. So the final result (as of writing) is Android 9 and iOS 7.5; you can also view the most recent usability test results yourself to form your own conclusions. What we can conclude though, is that Android and iOS are very similar in terms of usability, at least in the apps we have tested. Of course, there are apps on both platforms that are really very well designed, and apps which should never have been let into the store/market. Neither platform is immune to poorly designed apps. One difference that also needs to be considered as part of the user experience is the hardware, and this is where some issues come to the fore. Although you can buy very high quality Android phones, you can also buy very cheap, very poorly designed phones which can cause a terrible UX. One thing you have to admit about Apple is that their hardware is of a very high (and well designed) quality. Regardless, this test shows that with the right hardware and software combination, both of these mobile operating systems can shine, and really which you choose can come down to personal preference, without worrying about a huge gap between the two platforms. Either way, you should be a happy camper. What do you think about the results of this test? Why not create your own test to see what you find? Be sure to let us know your thoughts in the comment section below, and let us know if there is anything else you’d like to see us test. Thanks! Jacob is a usability geek at IntuitionHQ.com – a usability testing tool by designers for designers. When he’s not indulging his passion for the internets, he is probably studying Chinese (having spent three years in China) or reading about design. You can find him tweeting about usability @IntuitionHQ. My wife has an iphone 3gs and I have a Samsung Galaxy Captivate (she’s currently deciding whether to upgrade to the iphone 4 or get the same phone as me). When she initially started playing with my phone the interface buttons confused her, as did the concept of screens. As she used my phone more and more, she got more and more used to them and it’s made her decision a lot harder. When I’ve used her phone the handful of times I have, I miss the functionality of the back button, home button (press and hold for currently running apps), as well as the settings button (that works for virtually every app). I don’t think every android device is better than the iphone, but I think the good ones are. I had an old G1 and without jailbreaking it and modding the hell out of it, it couldn’t really hold a candle to the iphone in terms of performance. Now with performance being more or less equal, I like the options I have with my phone. The fact that I can use widgets, that I have a consistant way to navigate back and forth, that I can choose to lump my most used apps on my home screen and still have the same access to the rest of them as an iphone user. I have been a user of iOS and Android for quite a while now and I find it incredibly useful to use both and that is why I have an iOS device as well as an android device with me all the time. Each has it’s own strong and weak points, but together, make up the ultimate user experience. I think the name of the article is slightly misleading, you’re not really comparing the usability of the OSs, you’re comparing the usability of certain apps that are not even made by the people that created the OSs. Testing the OSs for stuff like phonebook, calls, email, default music player, default browser would’ve been a more objective comparison and would’ve provided a little more insight into the platforms themselves. I own an Android smartphone and I am very proud of it. I’ve never tested iOS, but with your article, I don’t want to right now. I was expecting this to compare the actual operating systems rather than apps but still a great article. Personally a bit factor as to why I prefer the interface of many apps on Android is the fact screen space isn’t wasted with back arrows and menu buttons, having he hardware buttons to go back a step and to bring up a menu are a huge advantage of Android to me. I didn’t use an iPhone for quite a while but my girlfriend got on when the 3G S came out and I was shocked as to why so many people have hyped up the UI when I found it to be inconsistent and often unintuitive. I would like to see this battle featuring Windows Phone 7. Having switched from the 3GS a few weeks ago, I must say I’m seriously impressed with the UI and usability Microsoft have created. The title of your article is “Android vs iOS; A Usability Battle” but you tested apps designed by neither Apple nor Google. I would love to see a usability test where the user starts out with a phone in a cold state, where the screen is dark and the user has to find their way to the apps you used or do things like take a picture and MMS it to someone or take a picture and email it. Maybe even make a phone call, send a text, browse to a website. Usability of third-party apps isn’t usability of an OS. Make it interesting and throw in a Windows, Symbian or RIM device just for kicks. This may be a bit (or way) off topic, but is it just me or is RIM’s Blackberry totally adrift in this war? few years ago I’d hear friends say it’s the “ultimate smartphone”, I bought one 2 months ago and used it for like 2 days before going back to my iPhone. my 3GS iPhone. Everything you mention here is in iOS so i dont get how you could “miss” it every time you use an iOS device, i suggest you just learn how to do this in iOS before saying it cant do it. I think the entire test ends up being bogus for the simple fact that the Android OS is a complete rip-off of the iOS interface. Google did not invest their time in developing their own immersive experience, rather they just copied Apple’s work and changed it enough not to be sued. The fact that the actual device performance and reliability were not figured into the results is another large hole in my opinion. The fluidity, responsiveness and dependability of the device is a huge factor in the overall user experience. This test is nonsense, because it doesn’t compare native apps .. if you want to compare UX of mobile OS, you can’t do that with 3rd party apps .. make the same test with Contacts, Calls, Messages, Settings, Camera, Email and Browser .. it’s like comparing quality of cars by some custom paint job from some guy down the street ..
@Dawgbone: Interesting to get the experience of someone who has tried both platforms. I think you are right, it’s hard to compare the crap Android phones (and there are some awful ones) with an iPhone which is obviously aimed at the higher end. Comparing a high end Android phone with an iPhone is a lot fairer, and at the very least, both should provide an above average user experience. @Luis: Yeah, maybe I should have written Android vs iOS apps in the title. I think you still get the idea though; you can get well designed apps and poorly designed apps for each platform, and I don’t think either platform is without it’s merits. As I said in the article, you can also feel free to run your own test and see what kind of results you turn up. I’d be interested to see that kind of a post too. @Grim Cris: My conclusion isn’t that iOS is better or worse than Android, just that it’s possibly to design good apps and bad apps for both platforms. As other commenters have pointed out, it’d also be worth comparing the ‘official’ apps in order to get a fairer comparison. Still, I think both platforms can do a good job, and that’s what I think everyone should take out of this. @Lee: Thanks very much for the comment; interesting point about the hardware vs software buttons. I can’t see Apple incorporating hardware buttons any time soon though! @mumimumi: If Microsoft wanted to lend me a Windows Phone 7 (and rebrand to a better name) I’d be more than happy to test it! I have heard good things about the UI, but bad things about app selection and the way updates are rolled out, although I suppose that’s true with Android too. @Spike: That’d be a neat test to do. Android does seem very easy to me to set up, so long as you have a Google account. I think it’s ridiculous that you still have to connect an iPhone to a computer to be able to activate it, and I could see that being a stumbling point for a bunch of less technical people – in fact that has been my first hand experience supporting less tech savvy friends and family. I was a little disappointed in the article as it was only comparing 3 apps rather than the interface as a whole. A comparison between interfaces would have been more difficult. For instance, the widgets that are available in Android will require a longer initial set up by the user, but will likely save time in the long run. If you give both to new users, they will be able to get going with iOS faster because there is less that you can do or need to set up. Android will require a longer initial overhead, to learn the UI, but will make things easier in the long run. Search out the most far out apps and say android is better. @JesperA: last time I checked, iPhones and iPad still had only one button. dawgbone was refering to the “hardware” Back, Home and Menu buttons. I have the same experience. 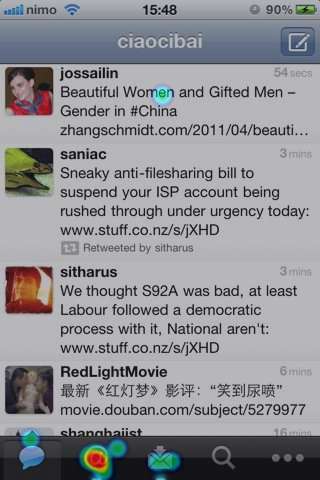 Each time I use my iPad2, I’m always dearly missing the Back and Menu buttons of my Android phone. Home button I don’t miss, especially as on iOS you can double click the Home button to get access to last few apps used. But no Back and Menu is a significant drawback for me. You re not comparing iOS VS Android but “X app in iOS VS X app in Android” which is totally different. @Bill: Androids similarities to iOS aren’t really what I’m debating here, but you should note that Android as a public, known entity predates iOS. Of course, you can look at earlier touch screen interfaces and say they are both copies of those as well. But I don’t really want to debate that here. Of course the actual device makes a huge difference to the UX, and I’ve said as much in the comments. Unfortunately I don’t have a whole lot of different devices at my disposal to go and test, but you can see reviews and comparisons on lots of different gadget sites if you are interested in that. @Stepan: I’d argue that the app ecosystem is what makes each OS successful, and as such the usability of popular apps makes a big difference to how people feel about each OS. You are more than welcome to test the 1st party apps though. @Stuntman: It’s actually 6 apps, but I think that’s a moot point. It’s just a quick test to show how some of the popular apps stack up against each other. I’m not really sure it does take longer to set up Android devices based on the people I know. You just log into your Google account and you are good to go. You certainly don’t have to set up widgets to use Android as much as you don’t have to install other apps to use IOS. Anyway, thanks for the comment. @Daniel: And there I was thinking he talked about starting cold with each OS. Oh wait, he did ;-) As for the usability of an OS vs apps, isn’t the OS just a platform for using apps? If the UX of apps doesn’t affect peoples experience of an OS, why does Apple bother vetting apps for the App Store? @JK: Surely the usability of the apps impacts of peoples overall UX of an OS. I’m sure I would barely use either of my iOS devices if they didn’t have apps. I’m not saying it’s the OS’ fault that some of the apps are badly designed, I’m just saying there are good and bad apps on each platform, which I’m sure you’d agree with. I’m not sure about your results. I changed back to iOS after a year of Android because around 90% of all apps I used on Android were horrible in usability. The fact that most applications on Android don’t seem to have a standard in design and navigation (that was my feeling) is a problem for me. Applications like Twitter imitate some great ideas from iOS that are really nice but in fact they are exceptions in their UX it’s not worth make an overall comparison from Android to iPhone. And I think theres a big difference whether an Android User is testing iOS apps and a iOS User is testing Android apps because each of them is accustomed with his device. The “Pandora – Wich UI do you prefer” test might be a bit biased by the selection of covers. Although they’re of course not part of the UI, the one is significantly more attractive than the other. Apart from that, a very interesting study! Cool article. I’ve had 3 iPhones, now I’m on the HTC Desire. Only thing that annoys me about Android is the fact that users are locked into using the vendor’s system. Also, my phone was a HTC flagship model when I bought it, but memory is so little, that it makes a poor user experience, because of the fact you can’t do with it what you want: install more apps. I think these kind of issues are almost over since most Android phones now ship with load of internal memory. Anyway, all in all, very interesting article. I have both phones, and honestly, the most important points have little or nothing to do with how some Apps are designed. This is not platform dependent, since the developers are the ones who decide how to implement UI in each device. I think there are more important details to take into consideration when considering which device is more usable. Like for example, an application installed on Android exposes its functionality to all the other installed apps so they can interoperate and share actions and data. Let’s say you want to upload a picture in Android. – Select the service you want to use to perform the action, among all the installed Apps: Facebook, Twitter, Picasa, Flickr, etc, etc. This list can grow if you install more apps. – The upload begins in the notification area, when you can see the progress. You may do other things in the meantime. If the upload fails, you can hit “retry” without having to repeat the whole process. – Decide where to upload your picture. – Navigate to the option that allows you to upload pictures. – You have to wait until the upload has finished before you can do anything else (not in all cases, but Facebook is an example). – If the upload fails, you have to hit the “upload” button again. Now imagine you want to upload two pictures to different targets. Android wins here. And this applies to every possible action you’d want to do with any type of shareable information. Another negative note is that, when your iPhone’s internal storage is almost full, the phone becomes slow and dumb. And, when an application is transferring data to/from Internet, the same happens. If you’re in a hurry, it can be desperately annoying. Multitasking is far better on an Android, too. If you’re writing a “tweet” with your iPhone and you switch to any other app, once you’re back to Twitter to finish it, it’s gone! And it hasn’t been saved to drafts! That’s what fake multitasking does. Android keeps the truly state of the application because it stays open. iPhone freezes it but, when you come back, you never know what you’ll get. So save your game before sending that important SMS or you’ll loose your points, dude! There are good things in the iPhone, though. Better graphics, better configuration menus, slicker UI controls… but it’s not perfect at all. Android has its failures, of course, and it’s far from perfection. But they’re improving faster and faster, while the latest 4.3 iOS still resembles to the first iPhone. It hasn’t changed much. I own both devices and test and develop software for both. I’ve found that both have advantages. One area I’d like to see explored is how the Android device’s fixed buttons affect usability (in apps that properly support them of course). For example, if you want to get to the previous screen, in Android the user can always use the back button. If you want to search there is a search button, and if you want to change settings in most apps you hit the menu button. In iOs the UI for these can vary significantly and the need to put a back button into many apps reduces the available interface space. But does it really matter? This is the question I’d love to know the answer to. As someone who owned a ipod touch for about a year before getting an Android phone, I may be a bit partial to iOS, but I personally think there is no question that the Android is more annoying and troublesome. The windowshade pulldown is brilliant, and having the extra buttons is good but everything else is either the same or… all too often… confusing. The flaw in your usability tests, and the reason the results came as they did I think, is you kept it to tasks that could be accomplished in just one tap. But on a lot of apps where you might be going for functionality a little more involved, Android apps are all too often confusing and frustrating. 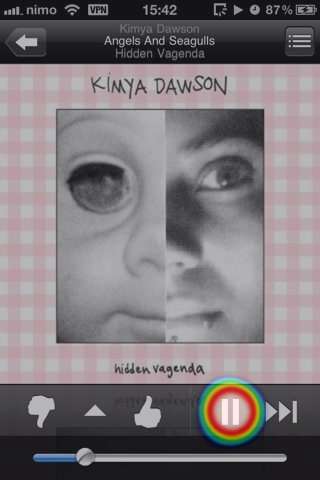 Perfect example, the Pandora app. I used Pandora for the first time EVER on my ipod touch, and it didn’t take me any time at all to figure out how to create a station and get going. Fast forward to when I got my Android phone and downloaded the Pandora app… I figured out how to get to my existing stations but I didn’t see any way to make a new station. I thought “This is stupid, why’d the take out creating new stations on Android? !” Eventually I found it, but that’s the thing… “eventually” is not good usability. The first time I used the app, I gave up looking for it and it’s only when I came back later I finally discovered it. Why they don’t just make the same interfaces across both versions is beyond me, but Android definitely gets the short end of the stick here. Yes, “@” is the protocal, but the envelope is the thought. And “DM” as an icon is perfectly suited to signify the curreny envelope function. Derp. As Steve Krug would say…”Don’t make me think”! Example: 4) Soundhound: How would you share this song? Obviously, the android version is likely to win because the button is clearly labeled “Share”. Buy if the question was revised to ask: How would you share this song on facebook? You’re likely to get a completely different result. Same thing applies to question: 5) Soundhound: How could you purchase this track? But what if the question was revised to reflect the user’s past experience with the OS. What if the iOS users where asked instead, “How could you download this song with iTunes”. Yes, the usability may be higher with one OS versus the other, but this likely may not translate to higher conversion rates, the ultimate goal of the developers. The study is a good effort, but is incomplete and therefore misleading. You did not test the usability of the operating systems, this is key to answering which platform is more intuitive or usable. 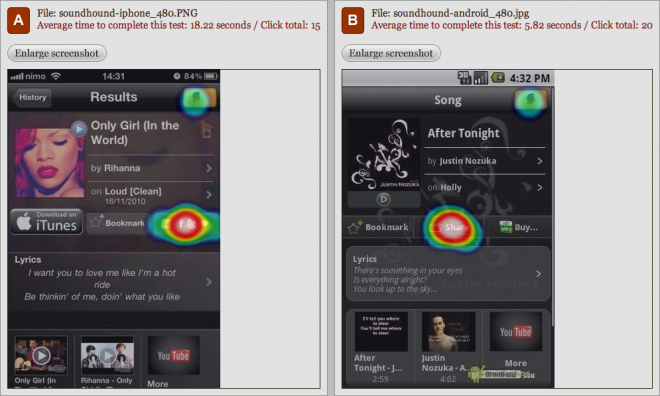 You tested the design of some popular mobile applications across the two platforms and left two key questions unanswered. 1) Which platform provides a better user experience? 2) 1) Does the design of the application reflect the design of the platform? This is a very nice comparison! I have an iPhone and Android phones, and based on the comparison of the screenshots, I think Android wins because it is overly simplified and does not have much clutter in terms of design and content. Though, many people are still enticed with iPhones, more than Android. I, too, would have preferred to see some comparisons of native apps or functions. For instance, asking users to add a website to their home screen. Even experienced Android users have a hard time doing this, because you don’t do it from the browser, you do it from the home screen. It is those sorts of subtle differences that put iOS ahead of Android in terms of usability…not in my opinion, but my experience. Also, I notice that you touch upon the hardware impacting the UX. This is true, but I don’t believe you give it enough credit. With Apple, the experience is going to be the same on every device. With Android, usability could be slightly better than iOS on device A, but light years behind iOS on device B. And the key to a great user experience is consistency. Completely agree with Spike’s comment – let ’em start out with the phone in the box it comes in and go from there for functionality and usability. Comparing Apple vs Google apps is fine, but what about making a freakin’ call or using call waiting or sending/receiving email or picture sharing? Camera quality? I’ve bought nexus s ~ 2 weeks ago ( I’ve been using iphone 3g before ). I used to love my Iphone, but after a day with nexus s I’m now 99% sure I’ll stay with my new android device. It’s so much better customizable, you can make it really stand out – my desktop ( with custom zeam launcher ) looks just amazing. 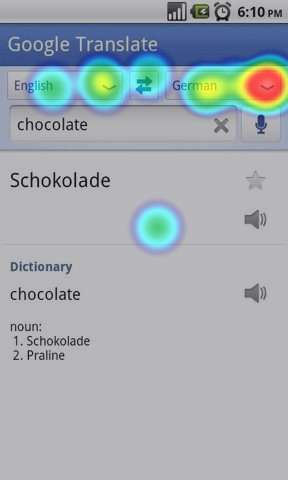 The voice recognition is another great feature – it really saves a lot of time. It worked with my linux desktop right away – no need to download anything, I can sync everything with my standard apps. What I like the most is the fact that I don’t have to jailbrake anything to get what I want. The only thing that dissapointed me at first was the battery, but after I gave it 3-4 decent charges it performs better now ( 8 hours on battery and at 68% now – constant tweets, 4sq checkins, music ) which is pretty good. The standard keyboard also feels somewhat different, I would say I like iphones one better. i personaly think android has a better UI, and some people will just say differently just because it isn’ an Iphone. Android is a lot better then what most people think. The test doesn’t reflect the usability of Android OS or iOS, because it’s only Apps that have been tested. The choice for the Apps tested is purely subjective. 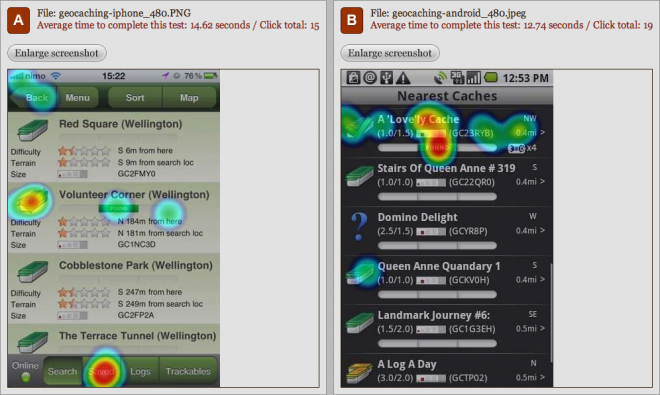 You should delete this post and stop doing usability tests. With all due respect, it’s clearly not your cup of tea. I don’t agree on many details of this “test” but good work. You just could not bring yourself to saying the Android interface won, am sure it would have been a different summation if the ios had the better interface. Excuse me, but could you also check the usability of Nokia devices? We have some gr8 stuffs!